This warm leek and cannellini bean salad was inspired by best friend, Chloe, who has a knack for making really tasty food with seemingly little effort. When I was in New Orleans a month ago (my my, how time flies), she whipped up a dish that had my name all over it: cannellini beans and leeks, sautéed and served in Boston Lettuce cups. She was working from a recipe, but did it quick and gracefully, the way she does everything culinary. I’m always inspired by the ease with which Chloe glides to the market, selects ingredients, and then concocts dinners without breaking a sweat. My kitchen habits are much more chaotic. I wasn’t sure that my rendition of this dish would stack up to Chloe’s, and it’s probably a little less refined than hers was. 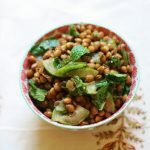 Still, I really loved how it turned out: a cross between a salad and winter legume stew: warm, filling, and grounding, but with a touch of fresh lemon and the versatility to be eaten cold, too. I often shy away from purchasing leeks because every cookbook I’ve ever owned warned me how sandy they are, and how much I’d have to wash them. I don’t even like having to rinse off an apple before I eat it, so this was discouraging. Ya know what? Washing leeks is not that big of a deal, especially if you chop them first, then let them soak in a big bowl, then rinse them, and then dry them, just as you might with salad. And leeks are great alternatives to onions, which is good news for the onion-shy, like me! This dish is nice and speedy, once you have the leeks prepped. If you’re very busy, you can try prepping the leeks a day in advance, and then cooking the following day. I often find that stepwise cooking like that makes me more encouraged to cook when I’m crazed. Heat the oil in a large skillet or sauté pan over medium heat. Add tje leeks, sauté for a minute, and then cook, covered, for 12-15 minutes, or until leeks are tender, translucent, and soft. Add a few tablespoons of water if they start to get overly dry. When the leeks are tender, add the garlic. Sauté for 2 minutes, stirring often. Add the cooked beans, the lemon, the dijon mustard, and salt and pepper to taste. Give everything a stir, until it's uniformly warm. Add a drizzle more of oil, if desired. 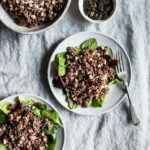 Serve salad in lettuce leaves, with whole grains, on a salad, or however you like! Leftover salad will keep in an airtight container in the fridge for up to 4 days. I enjoyed half of the dish two nights ago, and packed up the other half for a campus lunch today. I served it over zucchini noodles and cherry tomatoes, with some veggies on the side! Along with it, I brought yet another batch of my simple, creamy raw dressing (which is a busy student staple for me). It was delicious, and the flavors “married” pleasantly in the leftovers. Hope you like it–and let me know if you make any cool tweaks! Have a great start to the weekend, folks. Okay, here’s the thing with leeks. I just cannot be sold on them. They seem like such a waste! Also, more expensive than onions, so I nearly always replace leeks with onions. I know they’re not the same. Could you (or anyone else) tell me why I should convert to using leeks (at least more often)? So awesome that you could hang out with Chloe. I don’t know much about her, or her cookbook, but her cookbook is on my want list. I have an aversion to leeks as well, albeit for different reasons. There’s something about the texture that I just do not take to. Gena’s salad might be able to change my mind though! The first time I tried leeks it was in Paris, and they were “leeks vinaigrette.” It was two fat, whole leek bottoms, cooked to the point of being mushy, and sitting in a pond of oil. It was TERRIBLE, and I hated the texture, too. As long as I chop them, I do love the flavor! Aw, it’s not her cookbook! It was a Food and Wine cookbook (unless that’s what you meant, that you wanted a cookbook she owned but didn’t author). Chloe and I cook very, very differently–she’s an omni to the core–but she’s taught me so much about cooking, as did her Mom (my own Mom does not have the culinary equivalent of a gardener’s thumb), and she and I do share a big love of food. There’s no good reason, unless you try them and love them. I do slighter prefer the taste to that of onions, but I couldn’t argue that there’s a HUGE difference. They aren’t a waste if you use the parts that you don’t use in the salad for stock/broth/soup! Great post! I love it and I love bean dishes! I realized in my first CSA that leeks were not as sandy and dirty as everyone made them out to be – sure, they can be, but totally deal-able. No one ever warns you that beets can be just as dirty and stubborn and harder to really get clean! Great looking warm salad – I could go for a warmed salad this time of year! OMG, so true. Beets can be awful, as can regular leaf lettuce. Leeks are not THAT bad! “Simple, but elegant.” Thanks for “leeking” this recipe! (sorry, couldn’t resist 🙂 And great idea on the warm salad concept, love it! I have never eaten a leek before but it is something I really want to try! I never heard anyone warm me about it being sandy so that’s for the heads ups! now that i think about it, you don’t have onions in your recipes. I love them. Ha! When I started this blog, I still pretty much refused wholesale to touch onions or garlic. Now I use them, but I use them very, very selectively. Nice one, Gena! I’ve made a similar salad before but I like your simplicity. I used dill in mine as well… and have you ever tried flageolet beans? I prefer them much more than white kidney beans: small, firm yet creamy (I find cannellini can easily become mushy).. perfect for salads! I love this salad. I happen to like leeks better than onions as well–just a flavor thing I think. Also, your tupperware is the cutest thing ever! Personally, I think cleaning kale is a pain (the curly type). All those nicks and crannies are a pain to clean out. Simple and perfect! My kinda meal for sure! Will be making this! If you have a Trader Joes in your area they have frozen pre-cut and cleaned leeks. It would be a huge time saver and they are fairly inexpensive. Cool, silicone containers! I just wonder if they emit anything nasty when filled with tomatoes & such??!! Loving the “tiffins” with stainless right now, but they are loud & clunky. 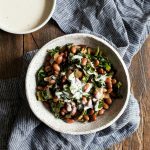 Love those beans…….my only real issue with beans is that they are so mega delicious, that I truly eat too many of them & then feel like my belly will explode. Seriously, My binge food is beans. Crazy? That looks so good and simple.. I LOVE white beans and leeks together… and the mustard .. YUM! Oh this sounds lovely. A nice mix between summer and fall. Pretty perfect for Sacramento weather considering it is October 2, and 100 degrees today. I don’t understand. I find my body craving warming foods even though it is so warm! Just made this and it was perfect! Quick and delicious, I sometimes have a hard time to make quick meals with a decent protein source. I didn’t have cannellini beans, but chickpeas were a great substitute! This was a winner, Gena! Easy, savory and a nice change from the usual salads. I made this tonight as a side for dinner and it was spectacular! I honestly didn’t expect so much amazing flavor. The mustard is great in it.